The HS200 is something of a pocket battleship in that it packs a lot of top-end technology into a small and practical frame. Both video and stills can be stored on a decent-sized 80GB hard disk along with multichannel audio. Full HD video resolution is offered while stills are captured at over 10MP. A good-sized f1.8 lens extends to a respectable 10x optically and there's a flash alongside it. A few buttons litter the external bodywork: one, an intelligent auto function, detects the most appropriate shooting mode. 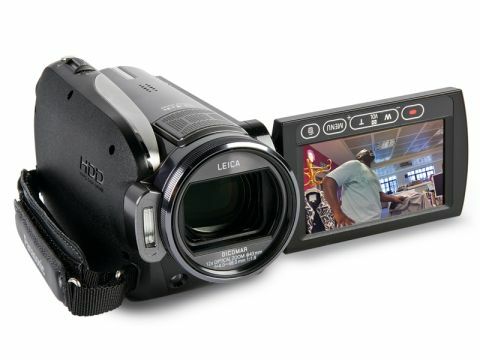 Like many compact HD models, the HS200 has no time or space for a viewfinder. Under the 16:9 colour LCD is a touchscreen for menu operation, while buttons are found for an optical image stabiliser, manual mode and the sockets. Menus are easy to negotiate and reveal all the regulars including colour night view, soft skin mode and red eye. All the socketry is matched with the right cables, except the HDMI. Pictures are exceptionally clean and realistic. Hues are natural and rich with no problems recording even the brightest of reds. Detail is pin sharp, and even when shooting subjects in motion or low light we were happy with the results. The auto functions, whether focus, white balance, or exposure, dealt capably and quickly with changes in the environment. Despite the upward-pointing microphone, sound was recorded to a high quality with virtually no handling noise audible.